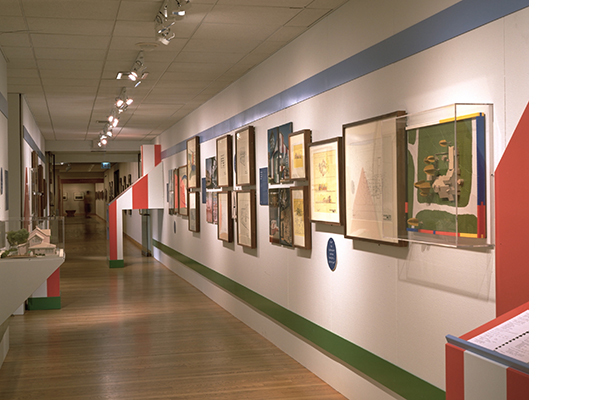 Architecture for Children transformed a normally solemn gallery into one of active engagement. Its curatorial goal was to present six architectural projects in a multi-generational way that children and adults would equally find of interest. Simple graphic and spatial gestures enhanced this goal, such as taking imagery from the way children draw. A horizon line of blue sky and a stripe of green grounded the exhibit with artwork found in-between. This created a zone of focus that children could concentrate on. Adult interpretive elements and labels were consistent with curatorial standards, but the introduction of a second tier helped to provoke children’s inquiry as they looked at representations of each building. Spaced at child heights, blue info dots moved across the gallery walls in rhythmic fashion. 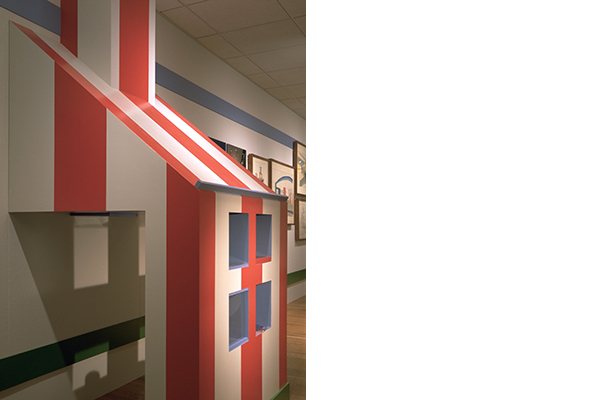 The Exploration Station project, also designed by Architecture Is Fun, inspired the gallery’s playhouse, which invited young museum-goers to move in and around it. Like a treasure hunt, children playfully discovered clues, information dots, and artifacts, from metal wall panels to textured concrete flooring, from each of the exhibit’s featured structures. A second comment book was added to the gallery on an accessible lower-height pedestal. Like the blue dot labels, this book was designed to engage children about their architectural experience and museum visit through their own words and pictures. Interior Architecture, Exhibit Design & Interpretive Design: Architecture Is Fun, Inc.